Anyone ever see the movie Brave? Princess Merida is a smart, strong, and amazingly inspiring Disney princess, her head emblazoned with an impossible and majestic red curly puff of hair. 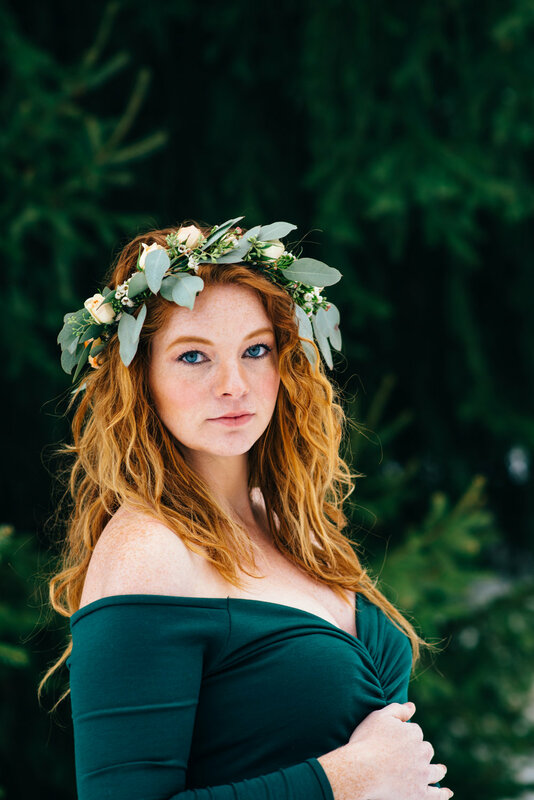 One of my dear friends, Jackie from j.jae photography, is the closest thing to a real life Merida we will ever find. She is obviously heart-breakingly gorgeous (and that HAIR! ), but she is every bit as smart, strong, and inspiring. I've had the blessing of working with her several times this year as her second shooter, and it makes my heart so happy that even though we both have photography businesses and literally live about 3 blocks apart, we can still be great friends and embrace the community over competition mindset. Jackie is super talented, and has taught me a lot about lighting and gear, but the most valuable part of knowing this Indiana PA photographer is the friendship that has grown out of the collaborations. I am super excited to be working with her in late January on a very special project that we can't wait to share! For this fun family/maternity session, we had fun traveling down to Lake Rowena in Ebensburg, searching out a setting that was foresty and magical. Jackie looked incredible in her gown from Kartay Photography (shop the look here on Etsy!) and flower crown from The Flower Gallery. Her husband was such a great sport, driving us to and from the lake (and treating my husband and I to Chinese after the shoot! ), and looked super sharp in his suit from the 700 shop. Soon to be big sister Penny was a trooper, taking a nasty bump on the head and cut on her eye like a champ just hours before that day. I don't know many two year olds that would still stand in the snow with a pretty bad boo boo and still smile! I hope you enjoy the photos from our super sweet afternoon spent together and with her adorable little (growing!) family!